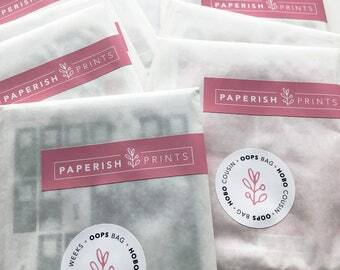 Welcome to Paperish Prints, where minimalist design and organization meet! All inserts (all cut by hand to make sure you get that smooth edge), lettering and art prints are all created and designed by me. Thank you so much for taking your time to check out our shop. We appreciate all the love and support you all have given us. We hope you enjoy our designs and that it helped you get super excited to plan! Please don't forget to follow our instagram as that's where we'll announce any discount codes, new items, etc. Again, please don't hesitate to message us if you have any questions or concern. Happy shopping friends! Please use #theishfam, #paperishprints or #paperishsquad so we can check out your work! Can't wait to see what you do with our creations! SHOP POLICY: There will be NO refunds or cancellations unless there was an issue with an order. Everything is made to order so that is the reason why there are no refunds or cancellations. If there is something with your order when the item arrives... please message us via Etsy so we can discuss on what we can do to make it better. If you have ANY questions at all, also feel free to message us via Etsy. Hi, I'm Nettie and I love ALL things modern, simple, and functional! Paperish Prints is a stationery/planner shop that features minimilistic and functional designs with a clean aesthetic, strong eye for detail and an emphasis on quality. This brand is also followed by my personal blog, Paperish Girl. It's always been a dream of mine to become my own boss and own a small shop. My dream had finally came true and I’m beyond blessed that you guys are taking the time to browse, favorite, or purchase something from my shop! Quick background: I am a graphic designer with a Bachelor of Arts degree from the Art Institute of California - Inland Empire. Designing has always been in my blood since I've taken yearbook class where I've learned "Pagemaker (Now InDesign)". I've learned so much over the years and realized simplicity is KEY. If you love simplicity, clean lines, modern, functional, and minimalistic designs then this shop is for you! All products are designed and created in-house by me. Currently I do not take custom work but possibly in the future! Please feel free to message me with any questions or concerns, and I'll be more than happy to help! Hey guys! Thank you so much for your interests in my shop!! I'm a graphic designer and a huge lover of all things stationery. I want to share with you guys my creativity and love for planners.